Scottish Dream Tours: More tea please! As promised yesterday, the rest of the tea story. Tea as a drink, has been around for about 5,000 years. The story goes, that the Emperor of China, Shen Nung, discovered tea. It was very common for all water to be boiled before use, and one day when the Emperor was visiting a distance part of his empire, they stopped for a rest. The servants set about boiling water when some leaves from a camellia sinensis plant fell into the pot and became infused. When the servant who first tried the brew, did not drop over dead, the Emperor proclaimed "tea". Tea was an important drink in the East for thousands of years before it started making its way West. In the early 1600's, the Dutch, who were considered "Kings of the Seas", started bringing back tea with them in their trade with the East. Tea caught on in the Dutch court and in the mid 1600's tea was introduced to New Amsterdam (later new York)in the American Colonies and became very big business. Tea had also become very fashionable in Russia, traveling across the continent by camel caravan. To this day, Russian Caravan Tea is very popular. Tea was also very fashionable in Portugal. About this time, teas was introduced to Great Britain but was offered as a medicinal drink and did not catch on. It was only when Charles II married a portuguese princess named Catherine de Broganza that tea caught on in the United Kingdom. Catherine brought a trunk of tea with her as part of her dowry and it soon became all the fashion. Tea at this time was still very expensive and was only popular with the elite, who were the only ones who could afford it. A pound of tea in the United Kingdom cost about $500US. By the mid 1700's, tea was actually the national beverage of the American Colonies. American had been used to getting their tea from the Dutch becaue theEnglish and Dutch had been in a war. When the war ended, England cut out the middle man and started tea trade with the colonies. When George III took over the throne in 1760, he was amazed at the amount of tea that was being exported to the colonies and decided he needed to capitolize on it as he aquired a huge defecit. In 1773 he raised the tax on tea from 12% to 119%! Not just a little jump, but a huge jump. What resulted was the Boston Tea party, which effectively ended America's love affair with tea and led to the Revolution of 1776. Tea had however, caught on quite well in Great Britain and by 1797 English tea drinking hits a rate of 2 pounds per capita annually, a rate that increases by five times over the next 10 years. 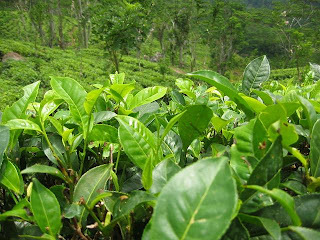 By the mid 1800's, the Ceylon, Darjeeling and Assam regions of India were being cultivated for tea production and for the first time the majority of tea is no longer coming from China. This of course, decreased the cost of tea and it became even more popular and quickly surpassed ale as the national drink. Today, green tea has become very popular, but no matter wether it is green, oolong or black, the only way it can be classified as tea, is if it comes from the original camellia sinensis plant. We have many different variaties that come from this plant and the differences are dependent on what region and how the plant is cultivated. Difference can also be based on the elevation the plant is grown at, the time of year the plant is grown and picked, and the location of the leaf on the plant itself. We also have today many herbal infusions but these are not tea. You can only call it tea, if it comes from the camellia sinensis plant. And yes, all tea has caffeine and this includes green tea. And yes, black tea is as beneficial as green tea because once again, they come from the same plant. Most tea in the States today is drank iced. You can credit this to Richard Blechynden. He decided that he would reintroduce tea to the American public, but had no idea that there would be a heatwave at the 1904 St. Loius Worlds Fair, where he intended to do this. He thought all was lost, but noticed a really good trade at the lemonade stands and decided to offer ice tea. It was a big hit. Thomas Sullivan is inadvertenty responisble for the tea bag. He was sending samples to clients in small silk bags and they thought they were suppose to steep the tea in the bag. Thomas Lipton thought it a wonderful way to use the chaff or what was left over after using the best leaves of the plant. Before this, the chaff was discarded. He saw a way to capitolize on this by putting he chaff into tea bags. Today, most tea sold in the United Kingdom, Ireland and the States is sold in tea bags.